Christmas season is fast approaching. Yay! 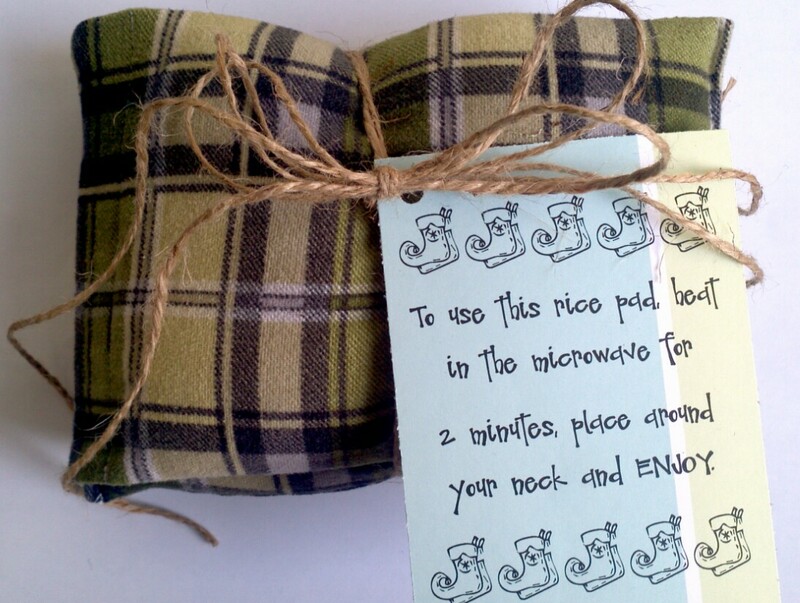 I thought that I would share a gift that we love to give that is always a hit, no matter who we give it to… Neck Warming Rice Pads. Do you have any of these? Yeah, we have a lot of them in all shapes and sizes. I just thought I would grab a few to show you. Our microwave is kept extra busy all winter long heating these babies up. 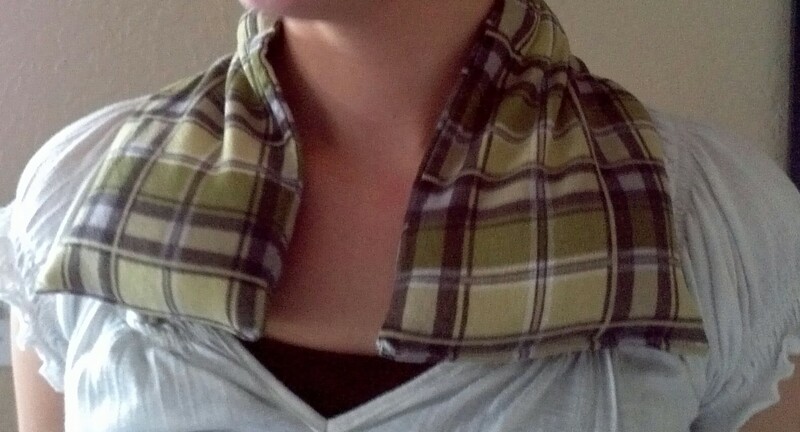 Last year I stumbled upon a faster, cheaper way to make the neck warmers using…dun…dun…DUN: Pillow cases! I was in my favorite fabric store, Goodwill, looking for fabric and noticed some really great flannel pillowcases. I’ve since learned that they always seem to have great pillowcases there and they are always $.99. You have to be super picky, though. I don’t buy it unless it looks brand new, and then I go home and wash it twice just because. Flannel is my favorite, but any sturdy fabric should work just fine. THREE!!! The thing that I like about plaid is that it already has cutting lines. Other patterns certainly work, though. Since the edges of the pillowcase are already sewn, this project is already part done. Yes! 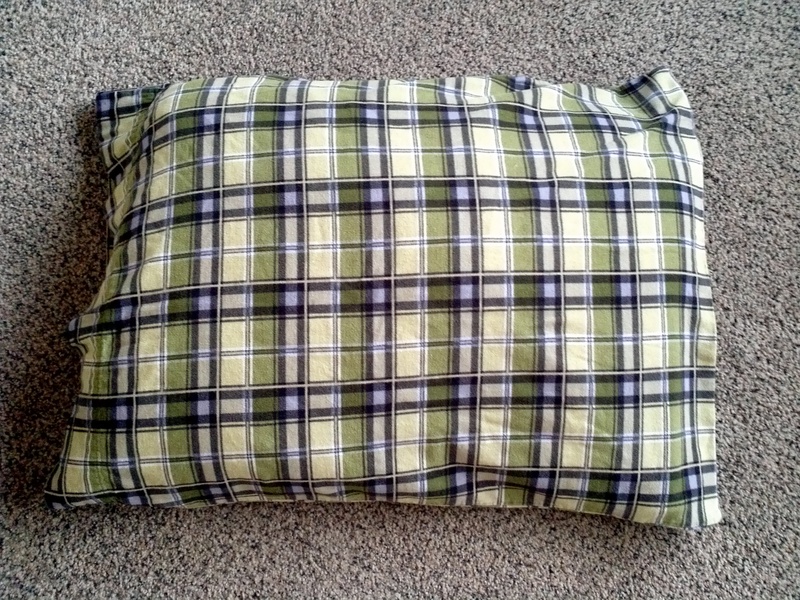 You may have noticed that the bottom portion of the above pillowcase is way off. Quality control must have been napping that day, but that’s ok. It’s just a quick re-cut and re-stitch fix. Turn the fabric so right sides are together, then pin. I’ll admit that I don’t always pin because flannel seems to stay put quite well. As a side note, that is not a yellow stain just below the pin cushion, just a weird shadow. 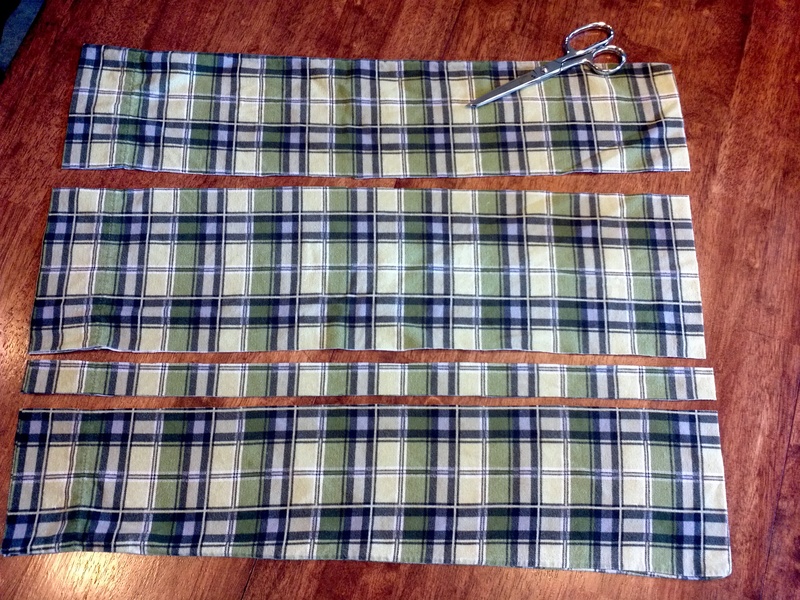 Now sew that long edge with a fairly tight straight stitch then turn it right side out. Also, I cut off the hemmed edge, but that is really optional. That took, what, maybe 60 seconds? Tops! Now you need to decide how you want to section out your pad so all the rice doesn’t clump to one spot. I like to have three sections with the end sections the same size and the center section slightly bigger so it easily fits around the neck. In this case I made each outward section 6 3/4 inches (don’t forget to allow an extra inch or so on the open end for closing it all up) and the center was whatever was left over. Now’s here’s where the fun begins: add rice. 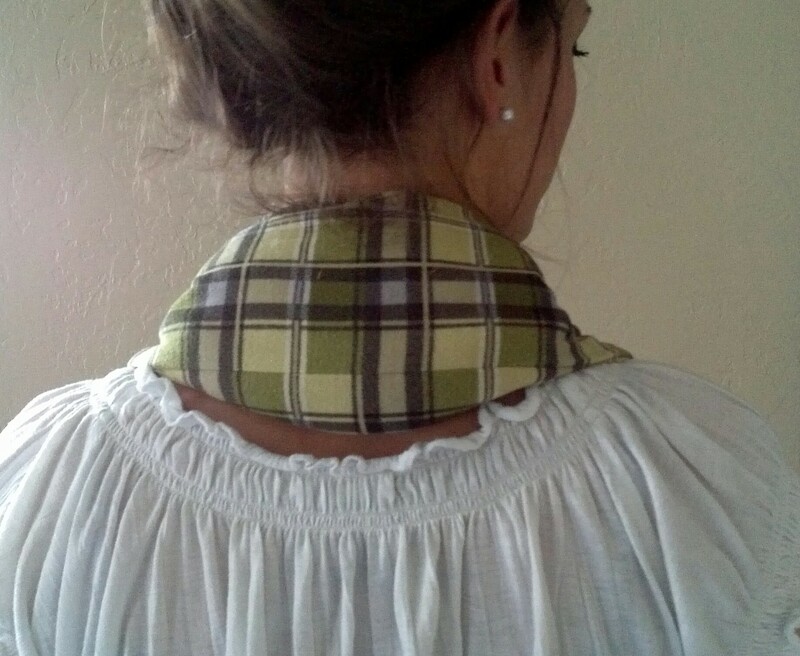 For this particular neck warmer I added 1 1/2 cups in the smaller outer sections and 2 cups in the larger center section. You don’t want to completely fill each section or it won’t bend easily and will be too heavy on the neck. I like to contain the rice by pinning it away from where I am sewing. 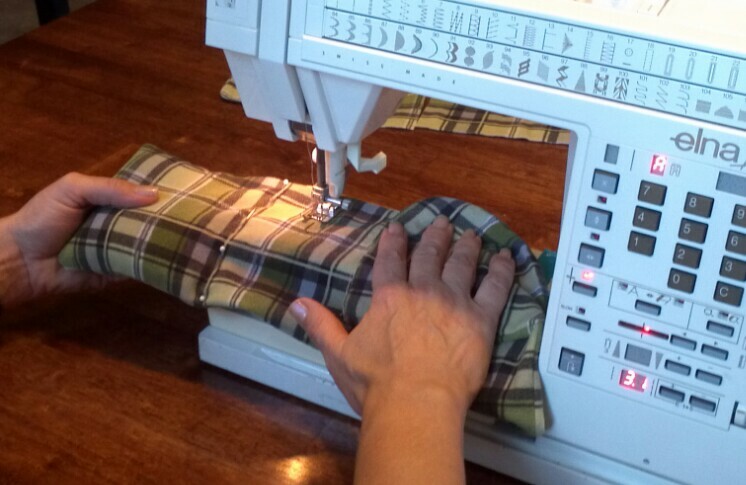 The rice adds weight, so I hold it up with my left hand as I sew, so the fabric eases through the machine smoothly. Now put rice in the center section, stitch as before, then fill the final section. At this point, fold the open ends of the fabric inward (trying to duplicate the size of the section on the opposite end) and then stitch. I stitch it twice just because. I also go back to the opposite end and stitch across it so both ends visually match. And it is DONE! Last year we made about 25 of these. My daughters helped me by turning the fabric right side out and adding rice to the sections. Fun memories! Here’s a pdf Gift Tag with RicePadInstructions that I created to add to each gift. I don’t like to add giftwrap since the weight would likely tear through. Just fold end over end, secure with ribbon and add the tag or whatever pretties you might like. Over the years we have given these rice pads to so many people: to teachers, friends, relatives, neighbors. Men, women and children all seem to appreciate ’em. There is nothing like the warmth and comfort they provide. Yep! They are a hit, which is exactly why we will make up another batch to hand out this year. We can’t have our loved ones freezing, can we? ← A “New” Wardrobe- Two Times a Year! Thank you so much for this tutorial! I also like to shop at my goodwill for repurposing items! 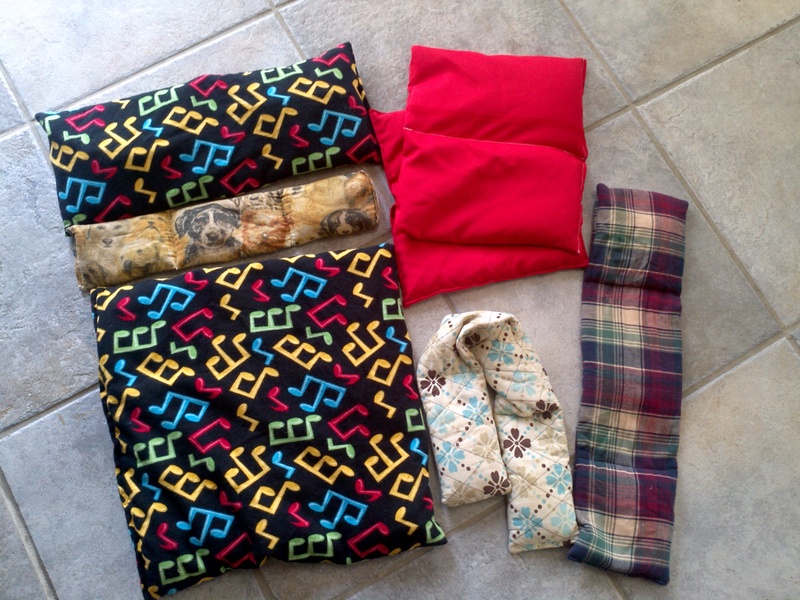 I love that you were able to get three neck warmers out of one $.99 pillowcase – add the rice, and you have a wonderful gift for less than $3! I also like your tag – so cute! Thanks again!